Few months ago I found an interesting website: http://ipinfodb.com/, it provided API which could “translate” any IP Address into a geography location including City/Region/Country as well as latitude/longitude and time zone information, to invoke its API, a registered API key is required (which is free). Since beforehand I stored visitor’s IP Addresses into my own database, I decided to utilize InfoDB API to store visitor’s GEO locations. So, the process is: Track visitor’s IP addresses -> “Translate” them to Geography location -> Show them on Google Map! The first task I need to do is track visitor’s IP Address, most of the time, user visits a website in browser submits an HTTP GET request (an HTTP data package) based on Transmission Control Protocol (not all the time) , browser passed the ball to DNS server(s), after several times “wall passes”, the original request delivered to the designation – the web server, during the process, the original Http request was possibly transferred through a number of routers/proxies and many other stuff, the request’s header information might have been updated: Via (Standard HTTP request header) or X-Forwarded-For (non-standard header but widely used), could be the original ISP’s information/IP Address OR possibly one of the proxy’s IP Address. Malicious application can forge HTTP request, if you are unlucky to trust it and have it inserted into Database, then SQL Injection hole will be utilized by Malicious application. Not all the visitors are human being, part of them (sometimes majority of them, for example, my website has very few visitors per week while a number of “robot visitors”^_^) could be search engine crawlers, I must distinguish human visitors and crawlers, otherwise I would be happy to see a lot of “visitors” came from “Mountain View, CA” ^_^. If the result is “0.0.0.0”, I will ignore it. Request which contains “Cookie” Header with “ASP.NET_SessionId” AND its value is equal with server side, then it should be a normal user who has just visited my website within the one session. If user’s browser has disabled Cookie then this rule will NOT be effective since the client request will never contain a Cookie header since the browser disabled it. Assume there is a crawler who crawls my website and accept storing cookie, then #1 will not be effective. However, I don’t think a crawler will firstly request a SessionID and then request again using the same SessionID). Talk is cheap, show me the code, I wrote a method to identify crawlers by applying two rules above. // then it should be a normal user (except maliciously forging, I don't think a crawler will firstly request a sessionID and then request again with the SessionID). return false;  // Should be a normal user browsing my website using a browser. Please be aware that I commented out HttpContext.Current.Request.Cookies["ASP.NET_SessionId"] != null, since I found that Request.Cookie will ALWAYS contain “ASP.NET_SessionId” EVENT IF the browser disabled Cookie storing, I will do further investigation and double check later! 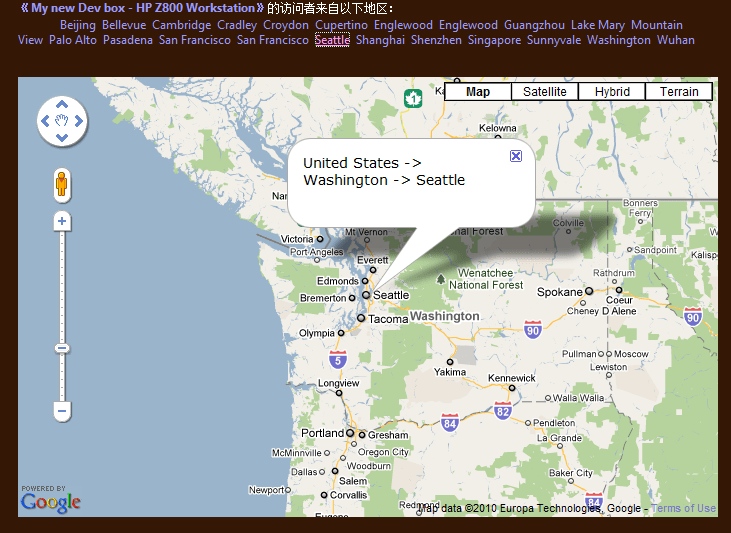 Wow, looks precise:), I am going to show visitor’s geolocation on Google Map (I know this compromises visitor’s privacy but my personal blog http://WayneYe.com is not a company and I will NEVER earn a cent by doing this:)). 2. Display a specified blog’s visitors’ geolocations on Google Map, screenshot below shows the visitors’ geolocations who visited my blog: My new Dev box – HP Z800 Workstation, by clicking each geolocation, it will show on Google Map. My visitor record page is: http://wayneye.com/VisitRecord.